Bring the liquid to a boil in a nice heavy saucepot; if using milk, keep an eye on things to make sure your pot doesn’t boil over, which will leave crusty gunk on your stove. Pour in the oats and spices and give ‘em a good stir. Turn the heat down so the oats are at a bare simmer and cook for 20-30 minutes. 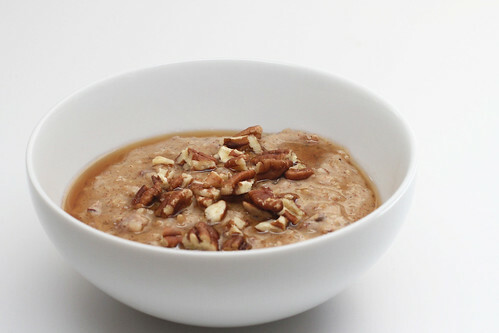 After 18 minutes or so, start checking for doneness; the oats should be creamy and porridge-like, but will still be chewy and have a pronounced nuttiness; they’ll pop between your teeth in a whimsical manner wholly unlike rolled or instant oats. 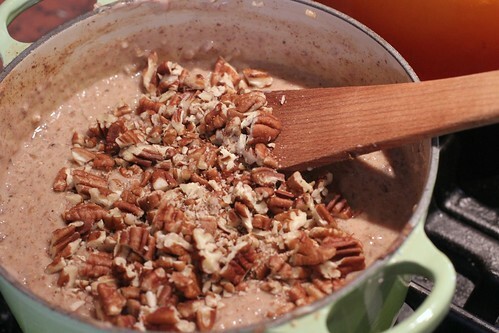 Stir in the nuts and add syrup to taste. This can be eaten immediately, or refrigerated and re-heated in the microwave in your office the next day; just add a little extra liquid during re-heating. 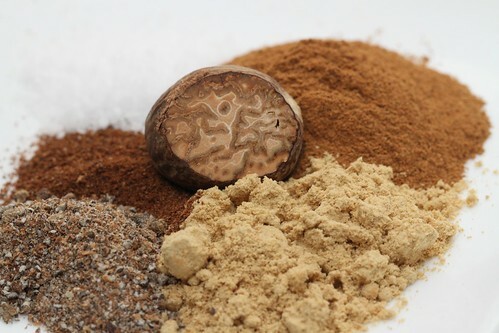 What is the super shimmering/shiny thing in the picture with the spices? These look super good, I may have to try some time. 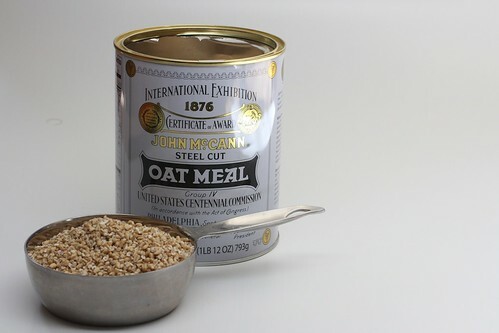 Though, at my store the bulk bins have steel cut oats, and then something else that is called Irish Oats, which look way different (more of a powder). Looks like what you used is what they call steel cut though. 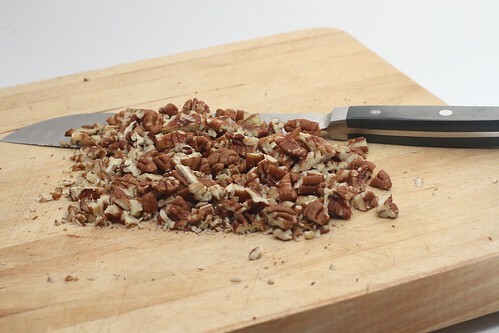 Crystal, do you mean the nutmeg seed? It’s such a closeup shot it looks about 4 times it’s real size. Thats probably what I mean. It just looks all super shiny and amazing to me. I saw these and was instantly infatuated because it contains two of my favorite things: Snickerdoodles and oats. 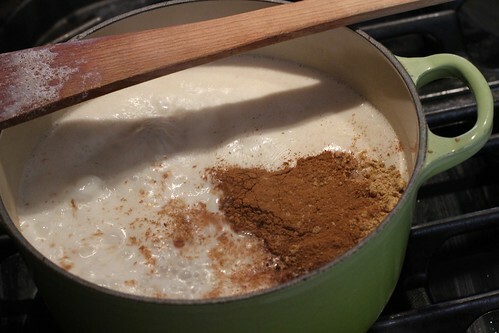 Knowing me, I would probably go way overboard on the cinnamon, but I’ve found that that’s rarely a bad thing. I’ve ALWAYS hated oatmeal until about a month ago when I went to visit my mom in the Upper Peninsula of Michigan. She eats hers with peanut butter, maple syrup, and wild blueberries from the freezer that had been picked the previous summer. This, so far, has been the only combination that has made oatmeal palatable to me. But then you had to throw in the word “snickerdoodle.” I must try this now. 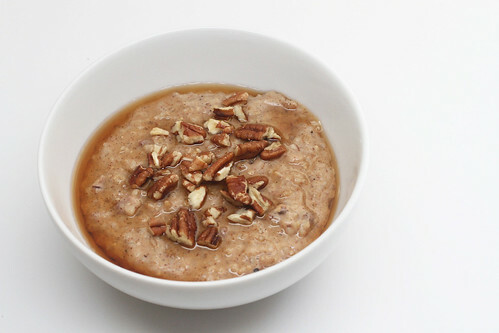 I have been trying to teach myself to like oatmeal, and this sounds delish. My current favorite combo is the addition of orange zest and dried cranberries, with a touch of brown sugar for sweetness. The steel cut oats are the only ones I can manage, since the texture is better (as in, there is some), but they do take time. I just made this and it’s delicious!